If you want to understand the wave of right-wing populism erupting in Europe and the United States, France is a good place to start. Le Pen’s party—and his style of nationalist, right-wing populism—has grown steadily ever since, sending tremors of panic through the French political establishment at regular intervals. Its current leader—Le Pen’s daughter Marine—has overall led in the polls for the 2017 presidential election for several years. And while a Le Pen presidency still looks unlikely, given the long-standing tendency of French voters to unite against the National Front in the second round of the country’s two-part elections, it is not at all inconceivable. Three new books—Jean-Yves Camus and Nicolas Lebourg’s Far-Right Politics in Europe, Jonathan Fenby’s France, and Maurice Samuels’s The Right to Difference—help illuminate different but related parts of this story. Camus, a political scientist, and Lebourg, a historian, place the National Front at the center of their wide-ranging survey of far-right parties across Europe. Fenby, a British journalist, surveys French politics since 1789 in an attempt to offer a better historical context for the country’s current crisis. And Samuels, a literary critic, examines modern French attempts to deal with ethnic and religious difference through a close analysis of the place of Jews in French culture. Each book, in its way, highlights many things that are peculiarly French about the country’s current crisis. But taken together, they provide a troubling account of just how easily ethno-nationalism can establish itself in a self-consciously liberal democracy—even one in which ethno-nationalism seemed permanently discredited because of the way its adherents in an earlier generation collaborated with fascism. 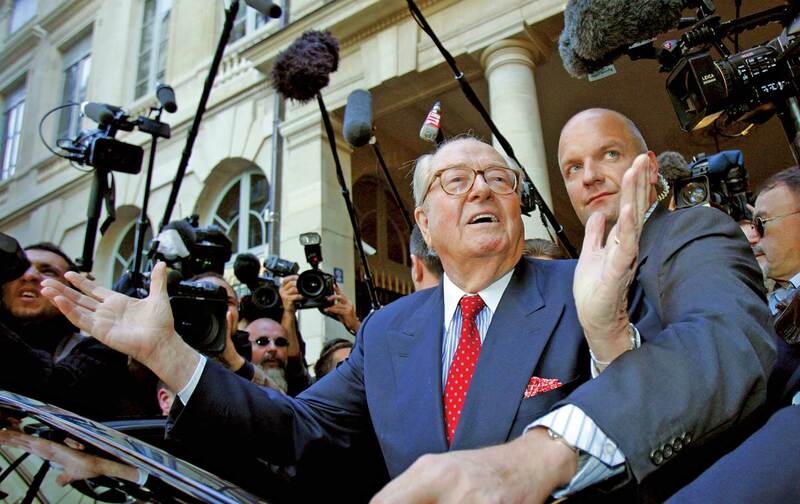 Above all, Le Pen père and fille have shown a talent for reworking a classic element of European right-wing ideologies, namely the vision of a lost golden age of a happy, organic society that the corrupt elites and alien invaders have combined to destroy. But whereas older right-wing parties associated this golden age with a rural, preindustrial society, the Front associates it with the heyday of heavy industry, when factory workers could earn a decent wage and aspire to a middle-class life. Obviously, this is a vision that Donald Trump has also deployed to great effect. Camus and Lebourg argue that the entire phenomenon of a political “far right” ultimately had its origins in the French Revolution of 1789, when the most steadfast opponents of that event chose to sit on the benches furthest to the right in the meeting place of the new National Assembly, even as the most radical deputies sat furthest to the left. For this reason, Camus and Lebourg argue that “to understand the far right in Europe as it now exists, we must in fact begin with French history.” But, as French academics who originally wrote for a French readership, they take a great deal about French history for granted. Readers unfamiliar with the subject may wish, at least initially, to turn elsewhere. Fenby is also very useful in his account of Marine Le Pen, deftly recounting her effort to “de-demonize” the party, which included a very public repudiation of her father when she accused him of damaging the Front because of his repeated racist and anti-Semitic remarks. It might also be noted that unlike Donald Trump, Marine Le Pen has little desire to reduce the size of government. In fact, in some ways, she wants to reinforce the powers of the central state as a way of breaking the power of the entrenched elites. She shares this ambition with populist politicians on the left like Jean-Luc Mélenchon; the difference is that she wants to expand government not for the sake of all, but for the sake of a specific “native French” population. A noted literary critic, Samuels tells his story through a series of largely literary case studies, tracing competing literary representations of Jews from the 18th century to the present. As these case studies reveal, even supposedly philo-Semitic French advocates of Jewish integration and equality have often sounded suspiciously like dyed-in-the-wool anti-Semites. Henri Grégoire, a Lorraine priest who became an important revolutionary after 1789, made his reputation with an essay that called for granting Jews equal rights as part of a project for their “physical, moral, and political regeneration.” He emphasized their disagreeable physical features (as Samuels summarizes: “sallow complexions, hooked noses, hollow eyes, prominent chins, frizzled hair”) and called them prone to personal filthiness, skin diseases, and masturbation. But Grégoire believed that they could be rescued from such ailments: The ultimate purpose of granting Jews equal rights was to erase their differences and eventually to have them convert to Catholicism. Intellectuals have often seized upon this example, and many more recent ones, to argue that the French have grounded their ideas of nationhood in a rigid brand of universalism that requires minorities to be, in Samuels’s words, “shorn of all particularities.” Some, like the American political theorist Wendy Brown, do so to criticize this supposed French model of universalism as repressive and intolerant, while in France, thinkers like the prominent neoconservative Alain Finkielkraut do so to celebrate France’s emphasis on national cohesion as opposed to what he believes is American-style individualism. Samuels notes, for instance, that in the French Revolution, the politicians who granted Jews full civil status did not require the sort of radical assimilation (and ulti­mately conversion) demanded by Grégoire. They required Jews to give up special communal privileges, but not the exercise of their religion or what present-day French critics call (mostly in reference to the hijab or burqa) “conspicuous” signs of religious adherence. Samuels makes a similar argument with regard to Jean Renoir’s great film about World War I, The Grand Illusion. Renoir has come in for withering attacks for attaching stereotypically Jewish qualities, including ostentatious wealth and physical weakness, to the film’s Jewish character, the soldier Rosenthal. But Samuels, in a subtle, careful reading, insists that the film expresses a more ambiguous attitude toward the Jews and ultimately endorses a “more open form of universalism” that accepts them—­however strong their marks of difference from other French citizens—as full members of the French nation. In America, important parts of cultural life as a whole have taken on a recognizably Jewish flavor. Something similar happened in Vienna and Budapest in the 19th and early 20th centuries, but nothing of the sort ever occurred in France. Allowing Jews to play a role as Jews is one thing; allowing them to help change the culture is another. These attitudes have a doubly corrosive effect. They exacerbate the alienation of young Muslims who already feel caught between two cultures, accepted nowhere and discriminated against everywhere. And they reinforce millions of other French people in their conviction (belied, in fact, by the social-scientific evidence) that Muslims will never successfully integrate into the national community and don’t really belong in France at all. In other words, they play directly into the hands of Marine Le Pen and the National Front. As the presidential election approaches (the two rounds of voting will take place on April 23 and May 7), the political situation in France remains enormously volatile. Both major parties are nearing a state of collapse, with the candidate of the center-right Républicains, François Fillon, now under indictment, and Socialist elected officials, including former prime minister Manuel Valls, fleeing their own candidate for Emmanuel Macron, the charismatic, centrist former banker. It is entirely possible that Macron will end up crushing Le Pen in the second round, despite her long-standing lead in the first-round polls. If so, commentators will joyously proclaim that the center has held, as it did in the Netherlands on March 15; that the worst have gone down to defeat despite their passionate intensity; and that the Western world’s populist fever has finally broken.